Downtown Roanoke was once a bustling area at lunchtime as the Palm Beach plant let out for lunch and the primarily female workforce headed downtown to eat. Due to the importance of the people who worked in the sewing plant to the city of Roanoke, Mayor Mike Fisher has been working on the words to place on a marker to be placed at the old company's location on Knight Avenue, just beyond Roy Williamson's old barber shop and cafe. He plans to put the marker close to the edge of the road on the property so people can see it and pull into the parking lot to make photos, he said. The city will pay for the marker. A couple of people have called who were interested in the project and said they appreciated his interest. Many in the county, including his mother, Rosalyn Fisher Quick, worked at the company, Fisher said. The Rock Stand resident rode in a car pool with other women to work. It was the same at nearby Handley Mills. That is the next marker Fisher will be working on. There were three shifts, and he remembers when the old 431 Beverly's Store never closed. The old timers remember Beverly's ice cream--three dips for a nickel. They would probably cost $4 on up today, he said. It was part of Roanoke's history like Handley Mills and other businesses. So many people worked at Palm Beach and Handley Mills. When they closed Roanoke did not do as well. Some people went out of town to work, some went to college or moved to LaGrange, Fisher said. He does not believe they will ever get another big industry here because of the two-lane U.S. Highway 431. He thinks elected officials have not pushed enough to widen it. From Roanoke to LaFayette there is no passing lane anywhere. There are so many 18-wheelers and logging trucks on the road. Trying to pass endangers them and the people you are meeting, he said. After the business on Knight Avenue closed several businesses tried their hand there but none were successful until Advantage Gripware moved there. Fisher said they have been good tenants for the city. Occasionally they ask for repairs but they are not complainers. On Knight Avenue, once known as Peachtree Street, the two-story building cozied up to the road. Assorted buildings dotted the site. The main building was torn down during Mayor Betty Ziglar's term. The remaining office now faces Handley Avenue where Advantage Gripware produces products for the movie industry. Advantage Gripware, run by Loet Farkas and his family, has grown and moved and are now in the building in the back part of the lot. At one time the buildings on Knight Avenue and Handley Avenue were connected. Palm Beach had 420 employees at one time, Jerry Pollard said. He worked there 18 and a half years, starting as a bundler in November, 1965, and leaving when it closed. He had moved up to assistant plant manager. It was a good place to work but when they left here they left hard feelings, he said. He thought it was all of a sudden. They had other sewing plants and the work was moved to one of them. "We made coats, vests, and we even got into making women's coats. The last several years we worked it was more women's coats than anything else," Pollard said. It was a union plant and at one point about 120 to 130 withdrew from the union. They refused to pay union dues. The business was under the Talladega pants shop. Palm Beach had different businesses different places. "We worked 420 people at one time--men worked mainly maintenance...some jobs made real good money," Pollard said. He moved to the house where he lives now at the foot of the hill. When he first started he lived on Louina Road but about 1972 moved to his present location which was convenient to his job. After Palm Beach shut down he went to work for Amoco. Downtown businesses appreciated the Palm Beach work force. The employees went to the City Cafe, the drugstores, the Dairy Queen. Everybody would turn out at the same time to go eat. Not many of the people he worked with are left. He remembers how upset they were when Palm Beach closed. It was a time when the sewing companies were going where they could get cheaper wages. The coats were of top quality and other items were top of the line, he said. Ten to 15 different labels were used in the items. Management came down from Cincinnati about once a month. Larry Ward headed the men's items. He would fly from the Cincinnati home office in a Cessna jet and land at the airport. But they had to drive to LaGrange to meet the plane and take off because the strip here was not long enough to take off with a heavily loaded plane. The original building, the Knight-McIntosh Manufacturing Company, was built in 1918 by William Knight to manufacture overalls and work pants. Employing 150 workers, an additional story was added for the production of Ella Smith dolls, although some say they were produced in a separate building on the lot. McIntosh bought an interest in the doll factory. Later that year electric elevators and steam heat were added. A broom factory was added in 1920. In 1922 Knight filed for bankruptcy and died in 1923. In 1924 the Roanoke Branch of Valley Mills was in the building. Then, Fuller Callaway bought it and started the Tru-Line Manufacturing Company. In 1928 the company doubled its capacity for machines and enlarged the space to manufacture pants and knickers. Machines and employees increased. It was the second largest employer in Roanoke in 1937 behind Handley Mills. In 1939 Goodall-Sanford Inc. bought the building to make Palm Beach suits. In 1949 Goodall-Sanford Inc. was added to the honor roll of Brands Names Foundation Inc. and received the "Certificate of Public Service" for the 60 years Goodall has "held public confidence in quality and fair pricing." The name was changed to Palm Beach Company, and it celebrated its 10th anniversary in Roanoke. In 1941 the company was in six different states and Cuba. Cuba was conducive to the Mohair/cotton material in the Palm Beach suit, which was a breakthrough in the textile industry. The cloth was woven in the Sanford Maine mills of Goodall and shipped to Cincinnati to be cut. 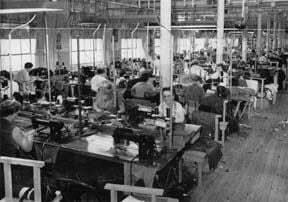 The cut material was then sent to Knoxville, Tenn., Danville, Ky., Roanoke, Ala., Sanford, Maine and Havana Cuba to be made into suits, which were then shipped to different stores. In 1951 Palm Beach went union with Amalgamated Clothing Workers of America and remained so for 29 years until 1980. There were other expansions. In 1969 Hattie Brown of Roanoke retired as supervisor after working for 43 years, only missing one day because of illness. In 1953 Superintendent John Galasso reported during the summer vacation period the inside of the building was painted, the entire building re-wired and fluorescent lighting installed throughout the building. Additionally, more modern individually driven machines were installed at a total cost of between $30,000 and $40,000. The same year workers got increased wages of 13 and a half cents an hour. This was negotiated between Local 613 of the Amalgamated Clothing Workers of America and the Palm Beach Company. Twenty delegates from the eight Palm Beach factories in five states participated in the negotiations. In Roanoke's Palm Beach the payroll increased by approximately $60,000 per year. Included in the negotiations were wider hospitalization and surgical benefits, including the children and dependent wife or husband of the workers, and a more liberal vacation plan. It was noted Local 613 had a Christmas party at the National Guard Armory and also to honor retiring employees. In 1963 community members and business leaders met at the Palm Beach building to mark the occasion of $20,000 raised locally from business firms and professional people to purchase additional property near Palm Beach for expansion. Some of those who worked hard on the expansion project were shown in the Feb. 7, 1963 Leader. It said 200 new jobs and $750,000 added payroll was made possible by these contributors. In 1975 Palm Beach employed 375 men and women. Operations continued until 1984 when Palm Beach closed. Employees worked from 7 a.m. to 4 p.m. with an hour off for lunch. Usually they worked five days a week. Nell Shelnutt, who worked there for 37 years, worked in the office. She said she worked with wonderful women, whom she still sees occasionally. More than 300 were working there when it closed. At times they had 400 working there. When there were big orders they hired more. Lunchtime was a wonderful time. They would walk through Belk where Payne's Furniture is today to go eat. Some went home to eat lunch. "It was a wonderful place to work for women. It was a great place. When it closed a lot of them were ready to retire. Most of them were married or widowed. We had a lot of young people come in there when they graduated from school before they got married or would go to college," she said. It was Goodall when she went to work there in 1948. "In the office we had Billy Brown, Helen Burns, Mary Jim Bonner, Bobby Bailey," she said naming them off and then stopping because she did not want to leave anyone out. It was such a good atmosphere, she added. Beautiful men's suits, clothes and pants were made there on rows and rows of machines. Roanoke was always commended for very high quality. She said they held a Palm Beach reunion until about 10 years ago. Some of the girls took charge of it and they would meet at the Galley.